Asian University of Bangladesh (AUB) received formal approval of the Government of the People’s Republic of Bangladesh on 4th January 1996 as a teaching and degree-awarding university under the Private University Act, 1992. AUB is accredited by the University Grant Commission of Bangladesh and The Government of Bangladesh. AUB is also accredited overseas. Asian University AUB job circular 2018 has been converted to an image file,so that everyone can read easily and download this office of the Asian University AUB. If you want to apply for this job,you should submit your application within required time. 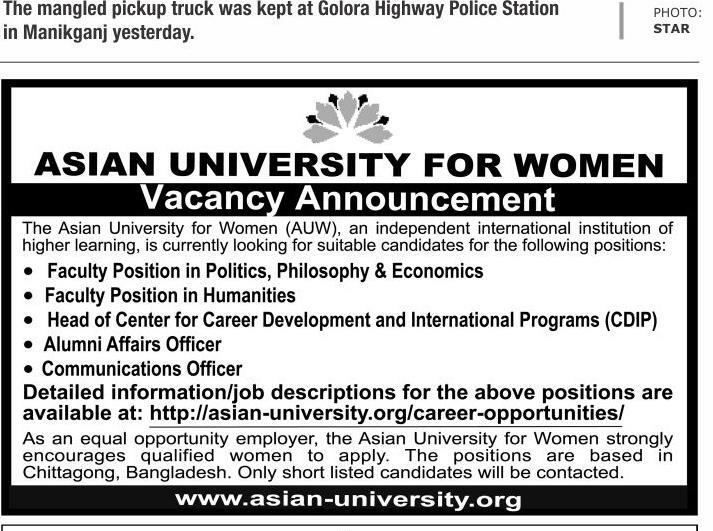 Asian University AUB job circular 2018 has been given below. The efforts to establish this university date back to 1990 when the idea was first mooted out by a life-long educationist, the founder of AUB, Professor Dr. Abulhasan M. Sadeq, to import high quality education as widely as possible from an inter-disciplinary, integrated ethico-human approach reflecting our values, heritage and principles. Efforts continued for mobilizing a pool of academic resources from experienced and committed Bangladeshi academicians attached to overseas universities. The academic programs of AUB have been prepared by experts with co-operation from reputed overseas universities to meet international standards of education.